Bringing their incredible Eagle technology down to a new, more affordable price point, the SRAM GX Eagle XG-1275 cassette is designed for fast, precise, and controllable 1x riding. Engineered for infinite freedom, this 1x cassette offers an extra-wide 10-50 tooth cassette. Featuring a stamped steel cog construction for 11 out of the 12 cogs employed in this lightweight cassette, SRAM employs their Full Pin technology to keep costs low on this 500% gear range cassette. 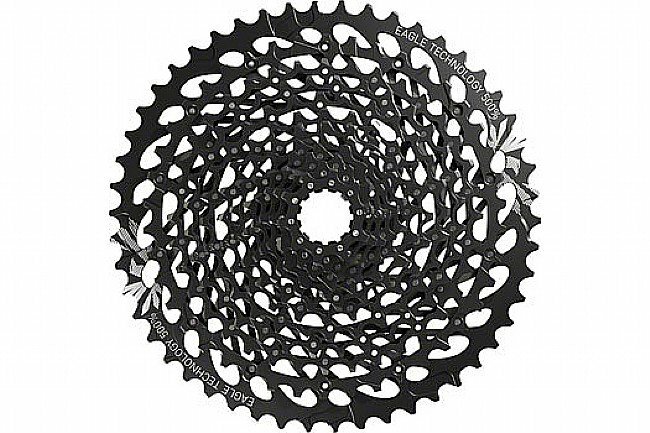 New, more affordable Eagle 10-50t 1x Cassette. 500% gear range is extra wide for conquering all terrain. Compatible with Eagle 1x12 drivetrains: GX, XO1, XX1. Full Pin tech keeps cost down while maintaining 1x-worthy strength. X-Glide 2 design improves shifting and chain retention. Compatible with SRAM XD Drive Body.